Even though Samsung’s Galaxy S9 and Galaxy S9+ mostly retain the design language of their predecessors, the company has made many improvements inside and outside the devices. Improved durability is one such area where the new series is better than its predecessor according to Samsung. To achieve this, Samsung has put a 20% thicker Gorilla Glass 5 on the front of the Galaxy S9 and S9+ at 0.6T, compared to Galaxy S8’s 0.5T. Samsung has also used the AL 7003 high-strength aluminum on the S9 which doesn’t deform as much as the AL 6013 used on the Galaxy S8. With these and many other minor improvements, the S9 and S9+ are supposed to be more durable than the previous Samsung flagship phones. SquareTrade has put Samsung’s claims about Galaxy S9’s durability to test, and they come out as mostly true. 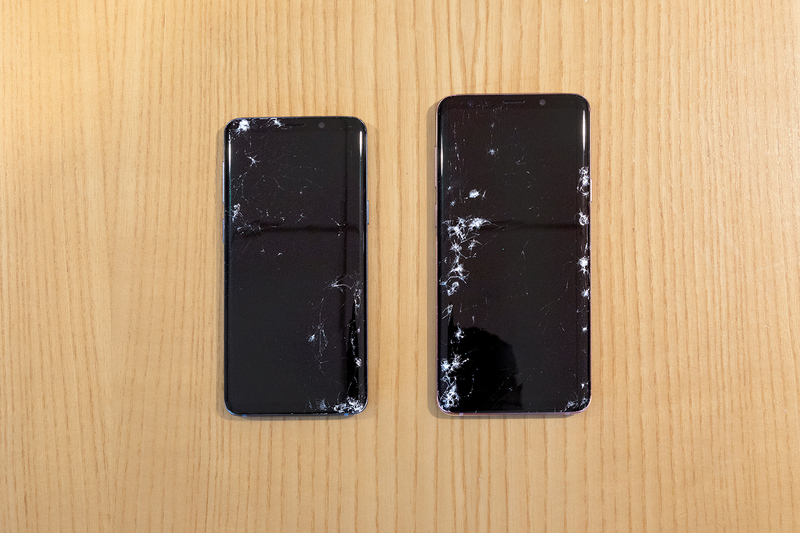 SquareTrade used drop machines to drop the Galaxy S9 and S9+ from 6 feet high on the front, back, and sides of the devices to test their durability. Though the Samsung’s latest flagship phones fared better than their predecessors, they still cracked and shattered at first drop. SquareTrade also conducted a tumble test and bend test, a test which has become rather common after Apple’s infamous bendgate, and the results are largely on expected lines. 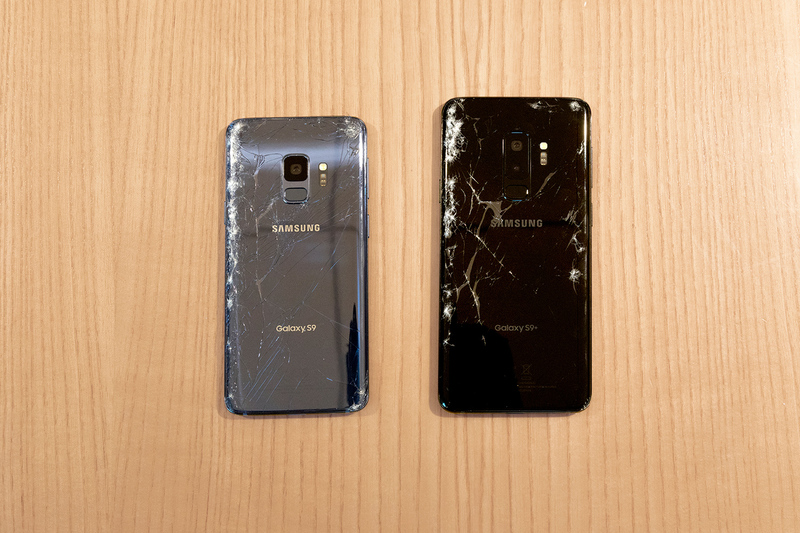 While the Galaxy S9 and S9+ do better than the previous flagship models, they are far from indestructible. 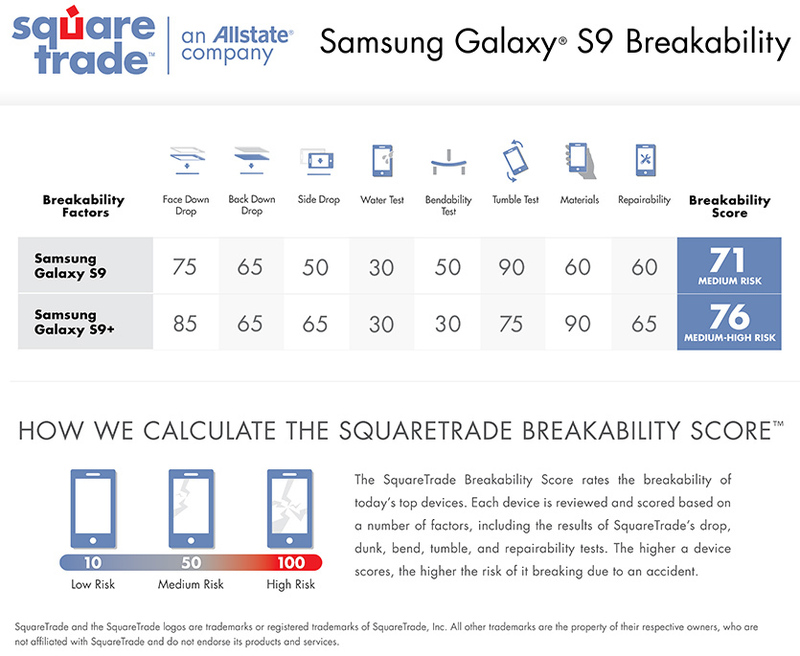 Based on these and many more tests, SquareTrade has awarded Breakability Scores of 71 for the Galaxy S9 and 76 for the Galaxy S9+, placing them in Medium Risk and Medium-High Risk categories respectively. The new flagships not only did better than their predecessors but also fared better than the iPhone X, which should give Samsung fans some internet bragging rights. While the new flagship phones are more durable than last year’s models, they still shatter when dropped, and so it is advisable to use a case or a cover if you’re clumsy with your phone. You might even want to consider the best Galaxy S9 screen protectors available now. Hopefully, durability becomes the next big trend now that the war on bezels is finally nearing completion.